one living in his family. overweight. Males are heavier boned and more masculine than females. active and reliable. Social and friendly with any one living in his family. to size and type. Well pronounced cheek muscles. muzzle. Stronger feature in males. but to be considered a cosmetic fault. are not visible while the mouth is closed. Standard type: reverse scissors preferred. Undershot, even-bite or scissors-bite accepted. the head fold or rose-ear. arched, tapering from shoulders to head, some dewlap allowed. Back of medium length, strong and broad. The loin short, broad and slightly arched corresponding to the withers. Sway back is a serious fault depending on its degree. be in proportion to the shoulders, not larger. Narrow hips are a serious fault. LEGS: Strong, straight and heavy in bone. Clear angulation of the stifle joint and femur head set. arched pasterns accepted. Weak or flattened pasterns are a serious fault. parallel to the line of moving. and heavy, Standard-type more lean and athletic. 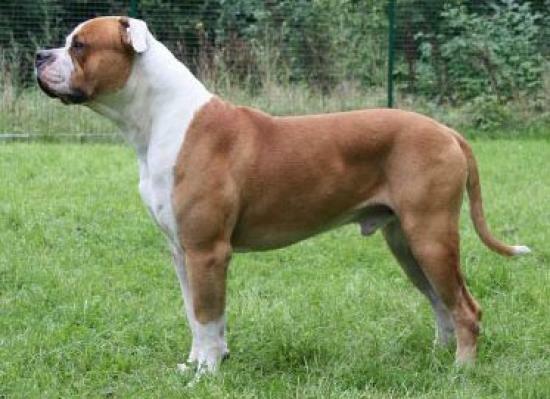 Color: white or white with brindle/red/fawn markings. Up to 90% color allowed. Always with white on the head. Disqualification: black mask, solid black coat, blue or merle markings. relation to the structure of a working dog. COSMETIC FAULTS: nose and eye color, ears,tail, less than 4 premolars missing, any minor teeth fault. stamina, aggressiveness or shyness, especially shyness with gunfire.